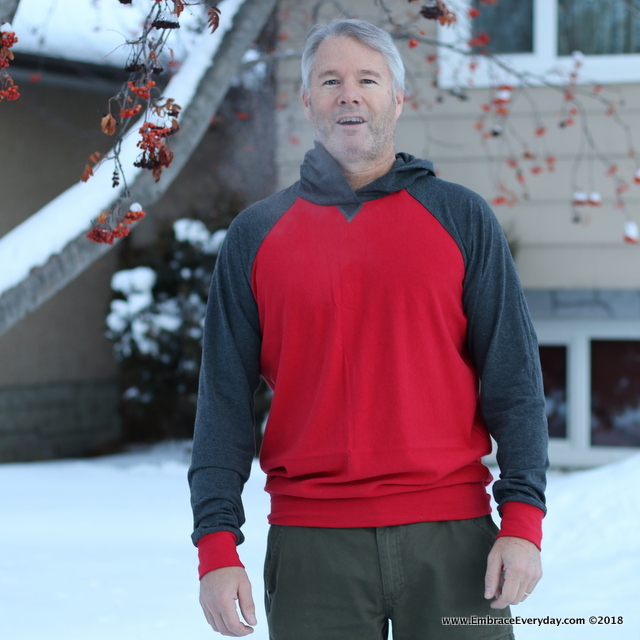 Wardrobe by Me has released their newest pattern this week, the Rebel Raglan. Technically it is a re-release…a version 2.0, if you will. 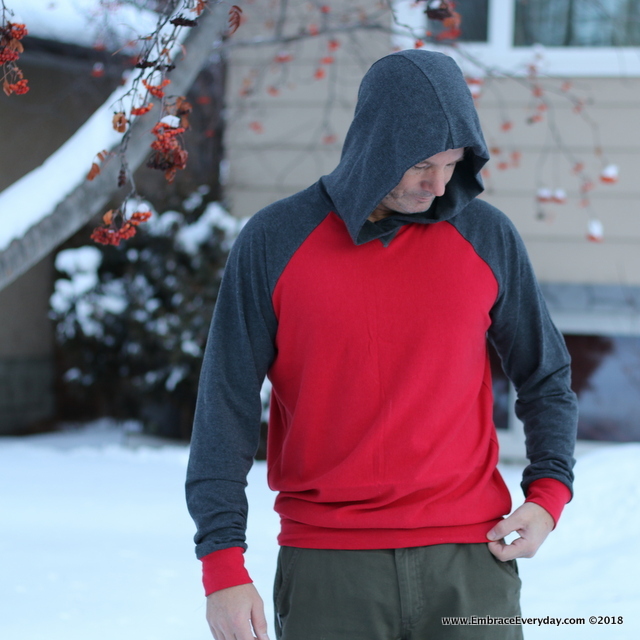 When Christina announced she was making some updates to the pattern by extending the size range, and adding a double layer hood and a kangaroo pocket I jumped right in. 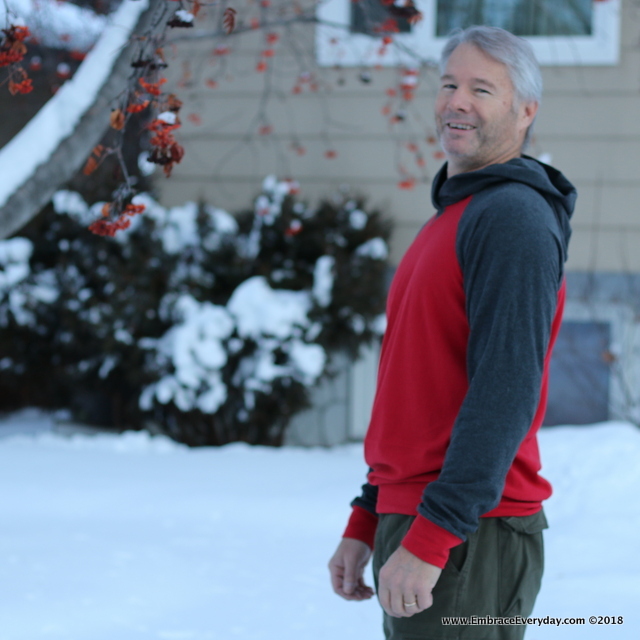 The original Rebel Raglan was the first Wardrobe by Me pattern I ever tested as well as the first men’s pattern I ever tested…actually it’s the first men’s pattern I had ever sewn! I never even blogged about that first one because my pictures were really bad! I was wanting to remake the Rebel and redo the pictures in the new year so this was perfect timing! I ended up making two Rebels- one with a hood and one without. The first one I made was the crew neck version of the pattern. 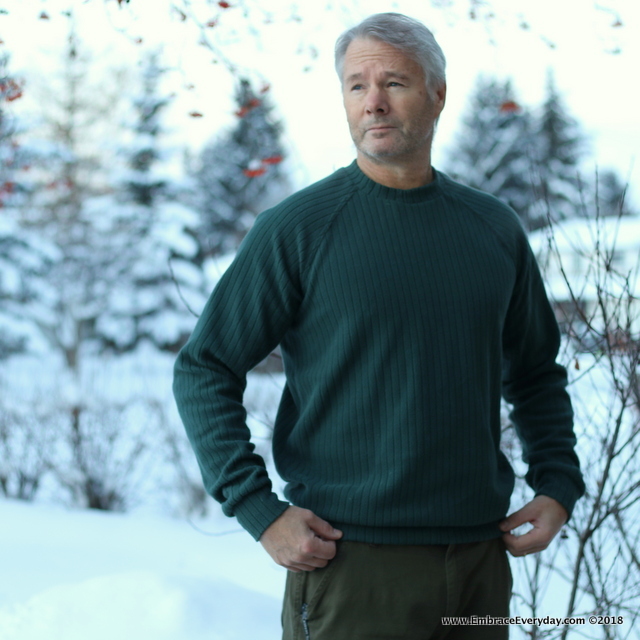 I used a hunter green fleece that has these wide ribs running through the fabric. I don’t know a lot about the fabric, as it is something I traded my mom for. She had picked it up for a project and it didn’t quite work for her so I told her that I had some stuff in my stash that would. She hasn’t seen my stash in a while and didn’t believe me when I said I was sure I would have something. I ended up having three different ones that she loved and she took some of all three! 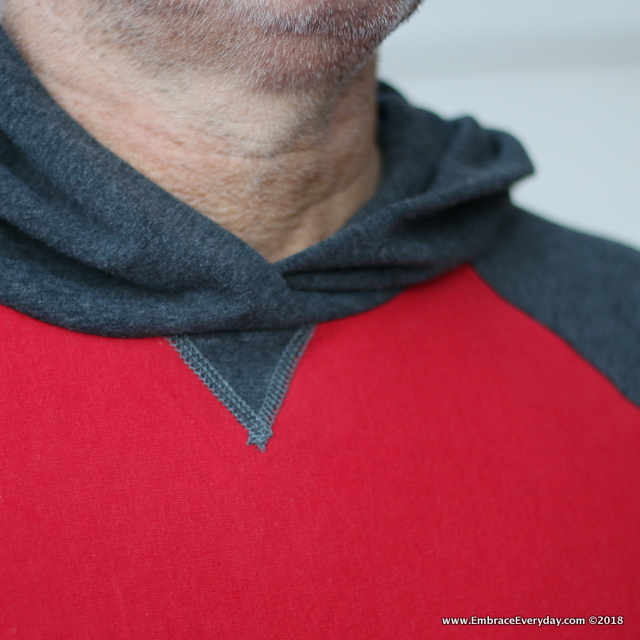 She asked if I could use this fleece and I knew that hubby would love the colour so it came home with me and ended up being the perfect fabric for the Rebel Raglan. The collar on mine is a bit smaller than the one in the pattern. My serger went a bit wild on me so I had to resew it but hubby was fine with it being a bit tighter around the neck. He really loves this one as it is dressy enough to wear to the office. The sleeves could be shortened a bit but he actually isn’t sure that he wants them shorter because he can reach for something and not have the sleeve ride up his arm. This top is such a quick sew that I actually had time to sew up a second version during the testing period. I went with the hooded version this time round. 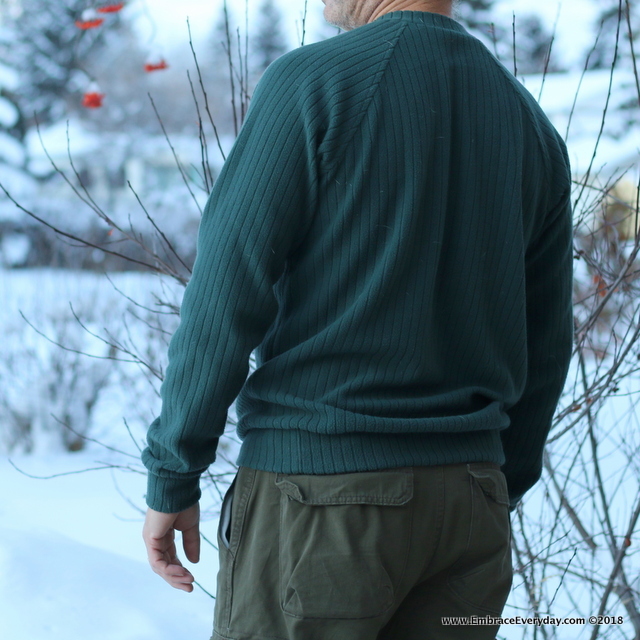 The fabric I used for this one is a bamboo french terry that I picked up a couple of years ago from an online fabric store that was going out of business. It was the first time I had ever ordered fabric online. It is so soft and I was saving to use for a special project. And since hubby loved the fleece Rebel I made and was wearing it non-stop from the time it came off the machine, I figured this was a good project to start using up some of this gorgeous fabric that I had acquired. It is a sportier look than the first one and I even got to use my new coverstitch machine to do some top stitching on the optional front triangle piece. I contemplated coverstitching the shoulder seams but hubby wanted them left plain. It’s probably just as well because I am finding it to be quite a learning curve using the coverstitch machine. It took me a lot longer than I want to admit just to do the triangle piece so I was quite happy to just finish it off without the topstitched seams. The Rebel Raglan is on sale for $9 US until Dec 14, 2018 and would make a perfect gift for the man/men in your life. I bet you can’t sew just one, either!! !